Google's App Engine now provides Endpoints, which offer a simple way to create RESTful services for clients. Here a simple Endpoint is created using the Java API, Maven and Intellij. App Engine endpoints allow you to create a RESTful service on Google’s infrastructure, which can be used as the backend for a mobile phone app, html site or some other client. Of course there are other similar and more standard solutions such as JAX-RS but I’m drawn to Google’s offering because I trust them to scale my service and, most importantly for me they have a built in authentication mechanism. In this first post I’ll use Intellij and Maven on the iMac. In all honesty I think you would find the development process of the Google Eclipse plugin more polished - but I want to stick to standard development tooling i.e. Maven. The bottom line is I don’t want a plugin performing voodoo which I don’t understand, incase it breaks one day and leaves me clueless. Now load Intellij and select import project. Find the folder your maven archetype created, which is test-blood-pressure-monitor in this example. Select OK and keep clicking the dialogs until the JDK selection appears. At the JDK selection, you should select a Java 1.7 SDK, as App Engine is moving to support only this Java version. You usually need to update the Maven dependencies via: right-clicking your project > Maven > Remimport. All the App Engine dependencies should change to 1.8.0. 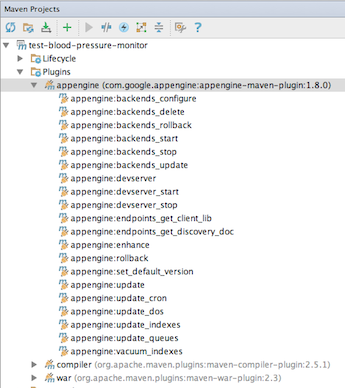 Usually I find the App Engine Maven plugin fails to download. If this is the case you can add it as a dependency in your pom.xml to force it to download (then delete the dependency once it's in your local repository). At this point I usually delete all .java, .jsp and web.xml entries pertinent to the guestbook - this gives a nice empty project to play with. folder. This is where the Maven plugin puts its auto-generated files, so you can see the .api file which defines your endpoints. After each change to the Endpoint class you must rerun appengine:endpoints_get_client_lib. Both the update and devserver goals will run the WAR plugin, so running endpoints_get:discovery_doc separately is not required. This application does not exist (app_id=u'planetjones-experiments'). 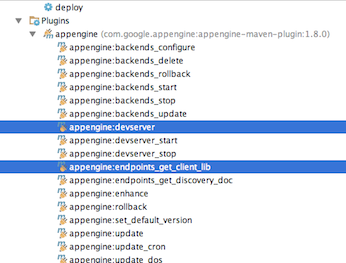 element to the configuration of the appengine-maven-plugin (see code line 48, earlier in this post). Doing this gives a prompt where you can enter your username and password for uploading to App Engine, when running the update goal. You should be able to repeat all of the curl tests by substituting the localhost URL to your actual URL e.g. Note the use of HTTPS. I have added this project to Github, so feel free to look around. Next I am going to secure this service, so only authenticated clients can access. And I will, of course, make the service interact with Google's datastore. But I feel it's beneficial in breaking this down into separate iterations, to aid understanding. Feel free to tweet, mail or comment with any questions.